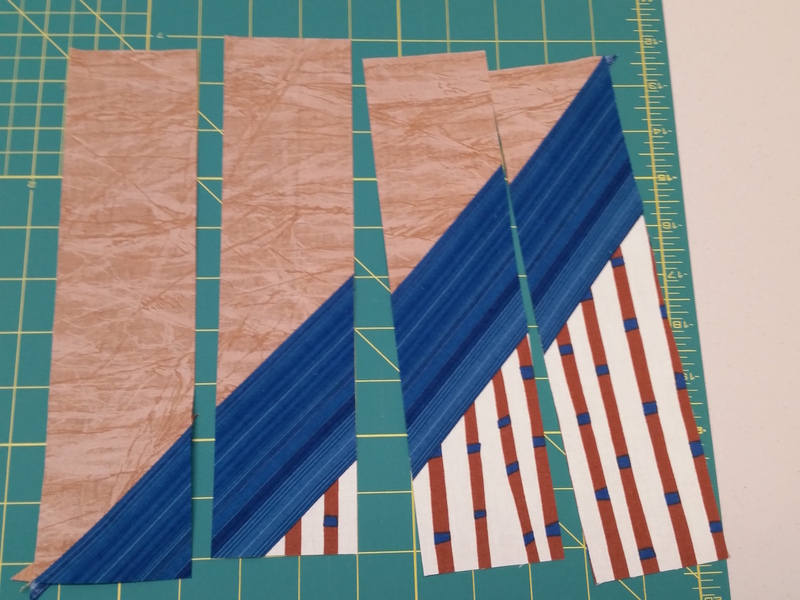 You might have noticed I’m not quilting much lately. (Plenty going on, though — I haven’t been idle.) 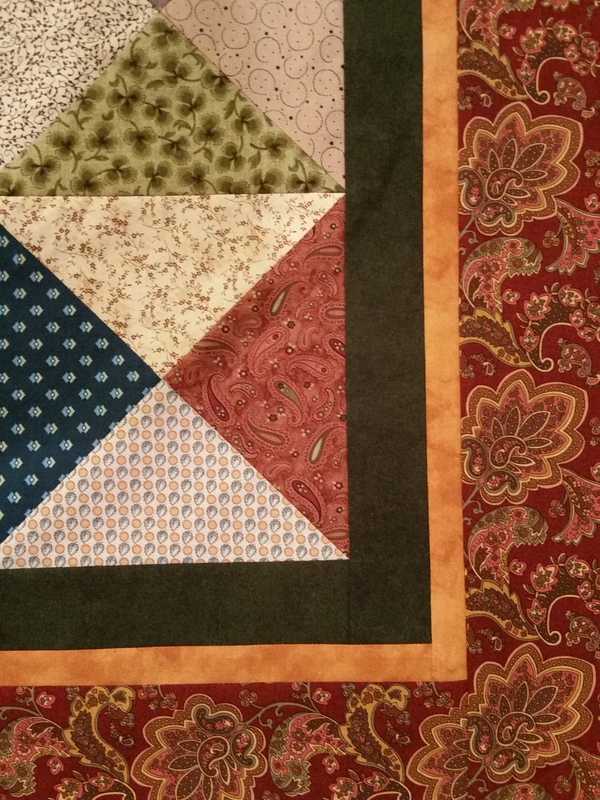 However I did finally finish the top to my hourglass quilt. It’s big, about 94″ square, a good size for a queen bed. And it’s too big for a photo while it lies on the floor. But here are a some shots to give you an idea of how it looks. 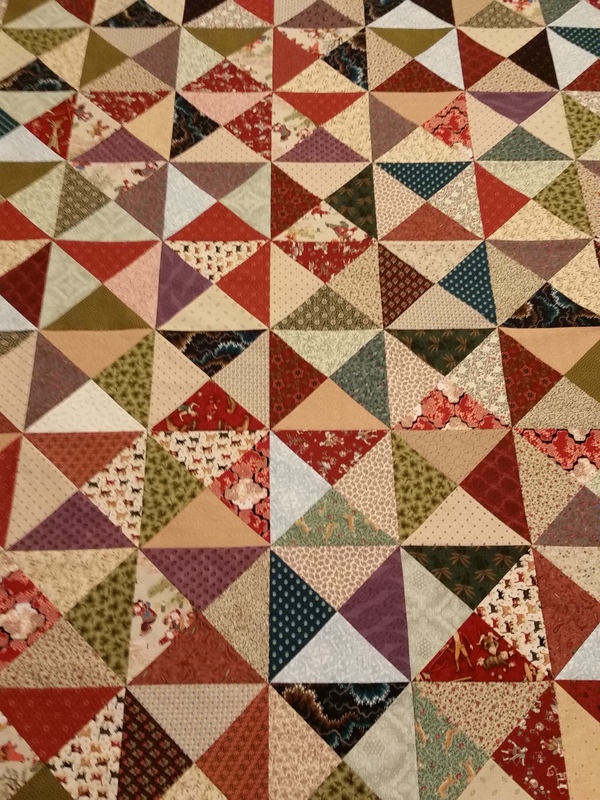 The blocks are 8″ finish in a 10×10 layout, making the center 80″ square. 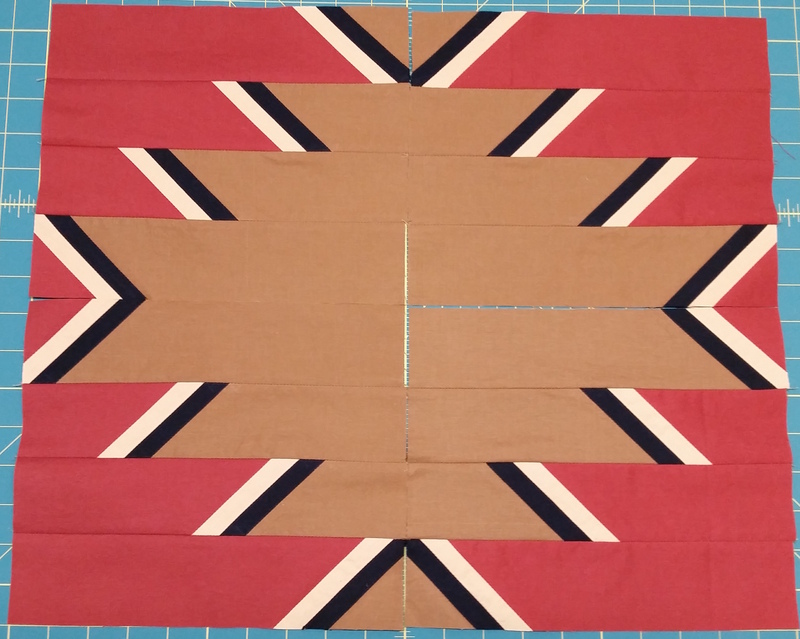 The borders add another 7″ on each side. 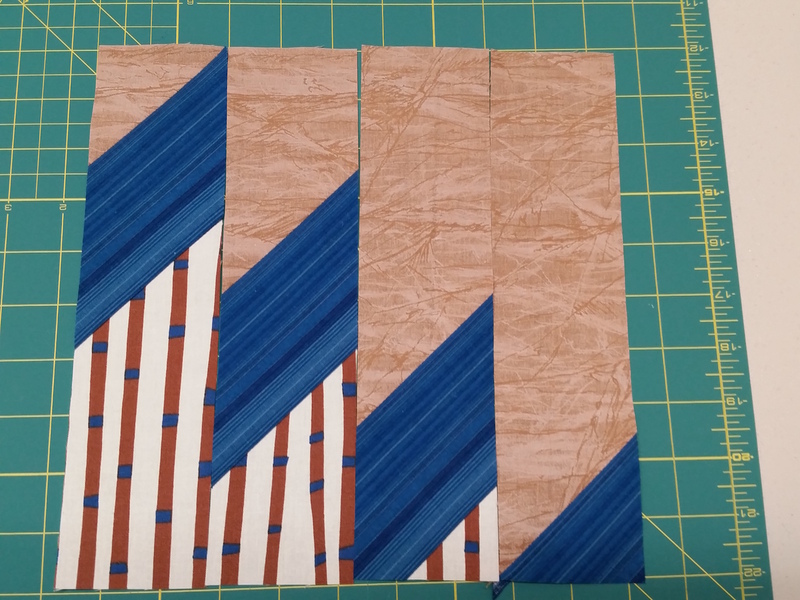 I chose a 3-layered border because the lovely rusty red print was too busy to sit next to the busy blocks. It needed separation. The innermost border is very dark green, though it might read black on your screen. The narrow middle border is orangey-gold. 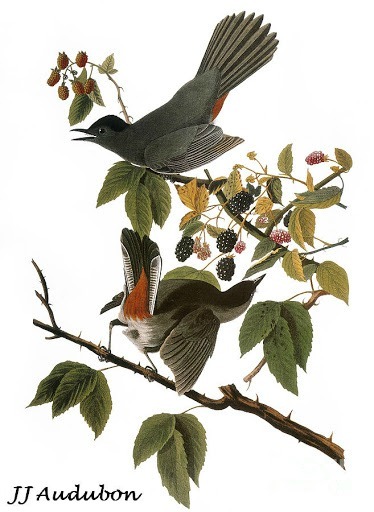 I have a dark green with olive print to bind it. In fact, I’ve sorted my quilts and picked a number of them to give away. I won’t miss them when they’re gone. Do you? 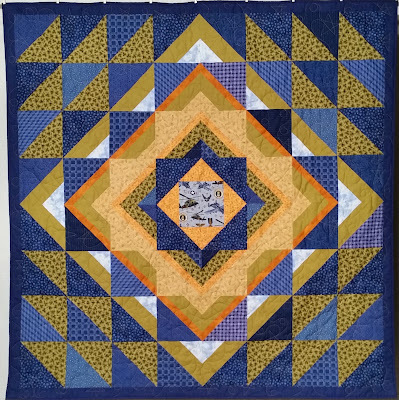 This entry was posted in Creativity, Quilting and tagged Giving quilts away, Hourglass block, Quilt block, Quilt top on September 16, 2015 by Melanie McNeil. I mentioned we went to visit our son. Coincidentally, we visited three quilts I’ve made for him. The first one is actually a comforter. 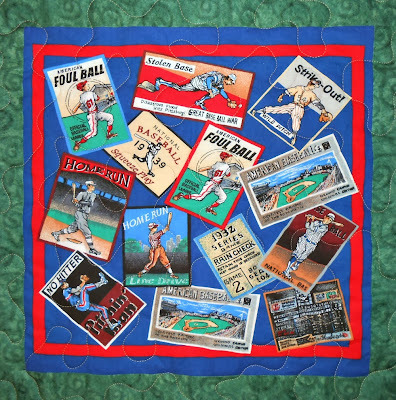 I made it for him when I was a new quilter and he was in high school. I made nine 9-patches of 8″ patches and set the 9-patch blocks in a 3×3 layout. Five of the big 24″ blocks are in solid navy and a dark blue print. 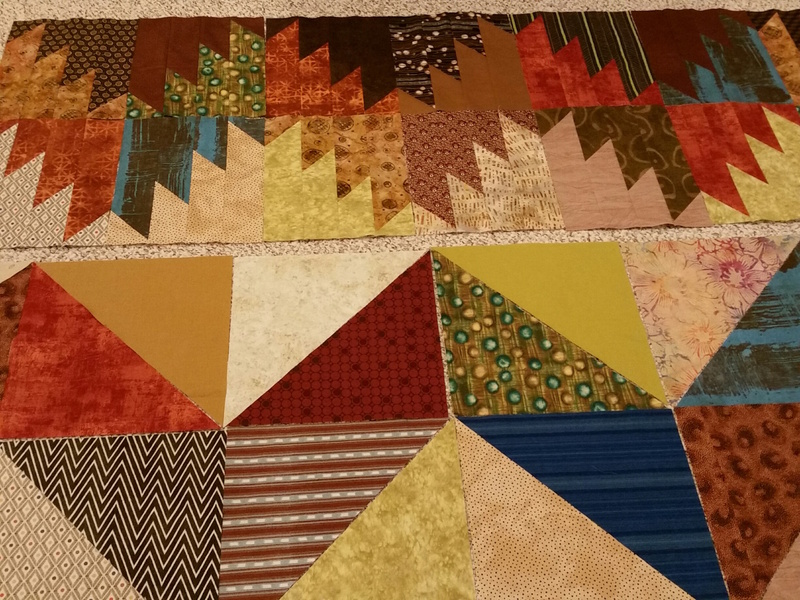 The other four blocks are in solid dark green and a dark green print. 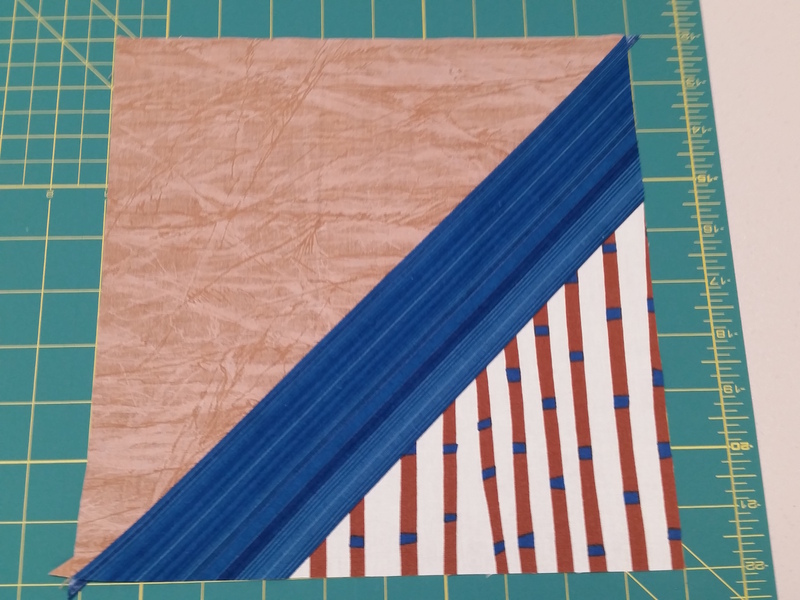 Solid navy bordered the whole to make a cover that is 88″ square. I used fat, fluffy polyester batting and a navy flannel sheet for the back. It was so big and the batting was so poofy, I knew I’d never get it quilted. Instead I yarn-tied it. As humble as it is, it is his favorite of the three quilts. I know why. Jim and I slept under it for almost two weeks. It is soft and cuddly, and very lightweight due to minimal piecing and the (now nearly non-existent) batting. The second one I made as his college graduation gift. I designed it myself using EQ7, and I must have tried dozens of iterations before deciding on the final version. I wrote more about it here, including the design inspirations and the construction process. [Son’s] Flight. 81″ x 81″. Finished in 2012. Photo by Jim Ruebush. 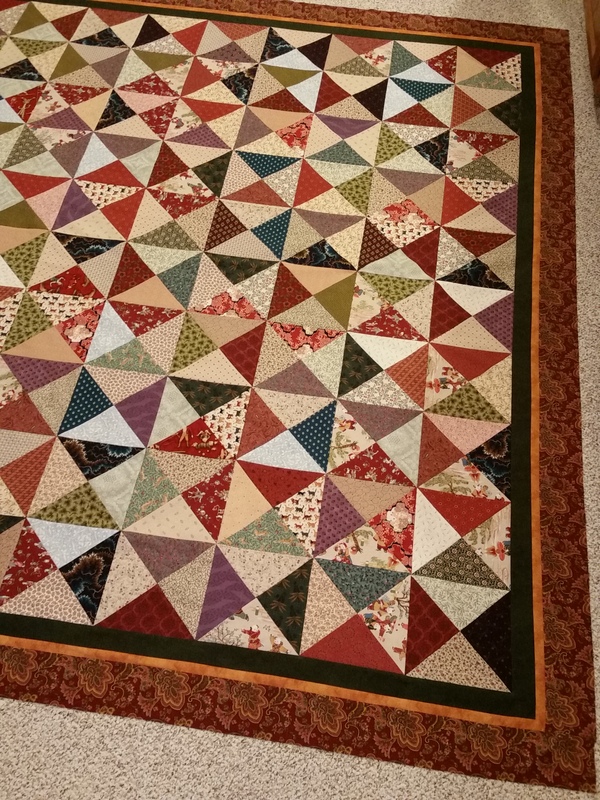 The final quilt is one I made last fall. Coincidentally, it also is in blues and greens! For Son. 68″ x 68″. November 2014. Photo by Jim Ruebush. I wrote more about this quilt here. 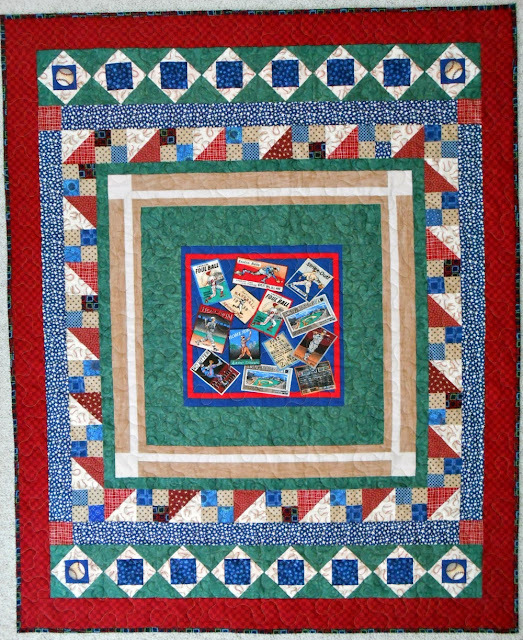 It’s always fun to see the quilts I’ve made, especially knowing that they are used and loved. All three of these quilts fit that bill. 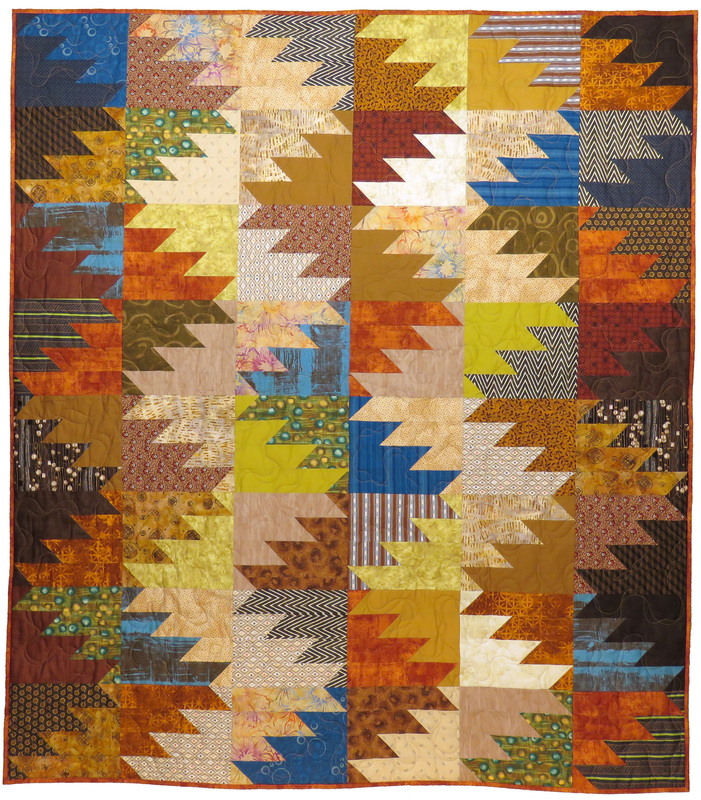 Do you ever get to visit quilts you’ve made? 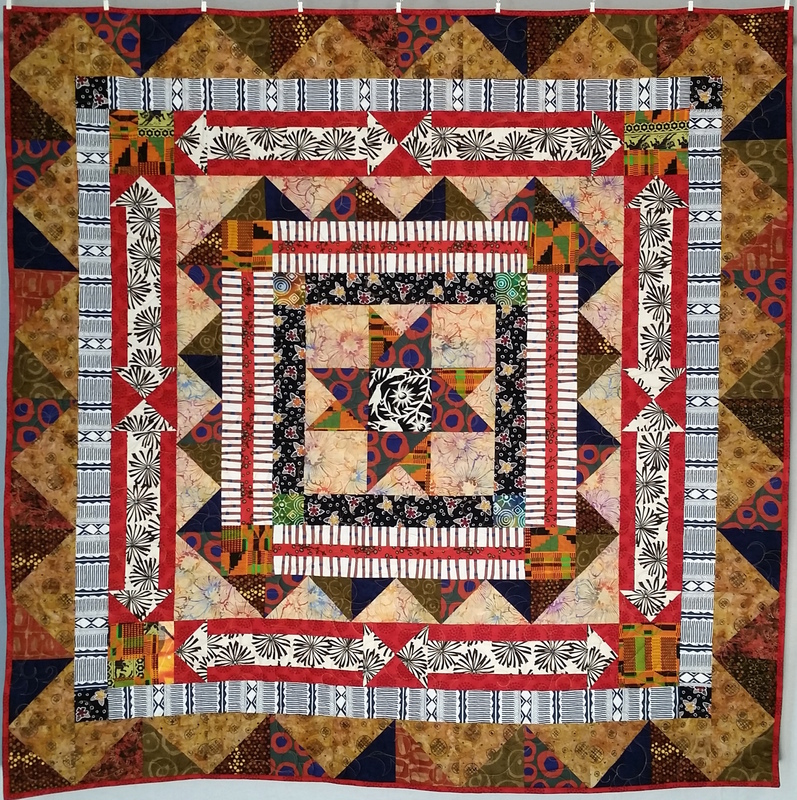 This entry was posted in Creativity, Quilting and tagged family, Fun, Gifts, love, Medallion quilts, Quilt block on August 20, 2015 by Melanie McNeil.